Tea Party Style Cake Collection with Teapot Cake and Cupcakes! 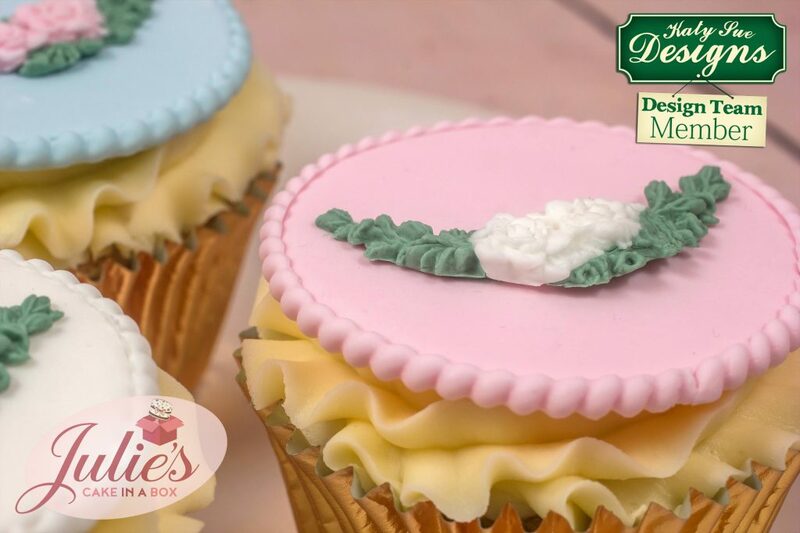 Julie from Julie’s Cake in a Box has put together a very helpful step by step project using our Rose Medley and Rope Border molds to make a Tea party style cake collection! We love this idea and hope it inspires you to make your own! Color approx. 500g each of white sugar paste with a small amount of pink and blue gel colors until you achieve a pale pink and pale blue. Color a small amount of sugar paste with green for the rose leaves. Cover the 12” round cake drum with pale pink sugar paste and stick cream ribbon to edge. Cut a small slice off the top of one of the half sphere cakes, turn over and stick to 3” cake card with buttercream, then fill and add the top half of the sphere cake. Crumb coat the sphere cake with buttercream and chill until firm. Color approx. 500g of sugar paste with a small amount of blue gel color until you achieve a pale blue. Roll out sugar paste and cover the sphere cake. Smooth the top and then carefully pull out the sugar paste as you smooth downwards until the whole cake is covered. Attach the sphere cake to the covered cake board towards the back of the board, leaving space at the front for the cupcakes. Add tylose powder to white sugarpaste and use to make a spout and handle shape. Insert 2 cocktail sticks into the handle and 1 cocktail stick into the spout, trim sticks to leave around 2cm sticking out. Set aside to firm up whilst you decorate the rest of the cake. Mold a piece of white sugar paste into a rounded dome shape for the teapot lid and attach to top of cake with edible glue. Then roll 2 thin sausages of white sugar paste, glue 1 around the edge of the dome and the other around the base of the teapot. Finally roll a ball of white sugar paste and glue to top of the lid. 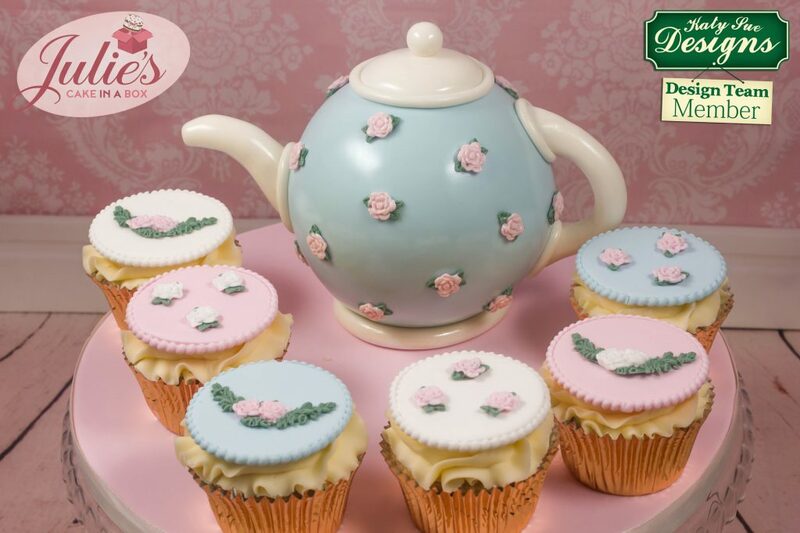 Use the Katy Sue Rose Medley Mold to make the medium sized roses to decorate the teapot. Add tylose powder to some pale pink and green sugar paste. 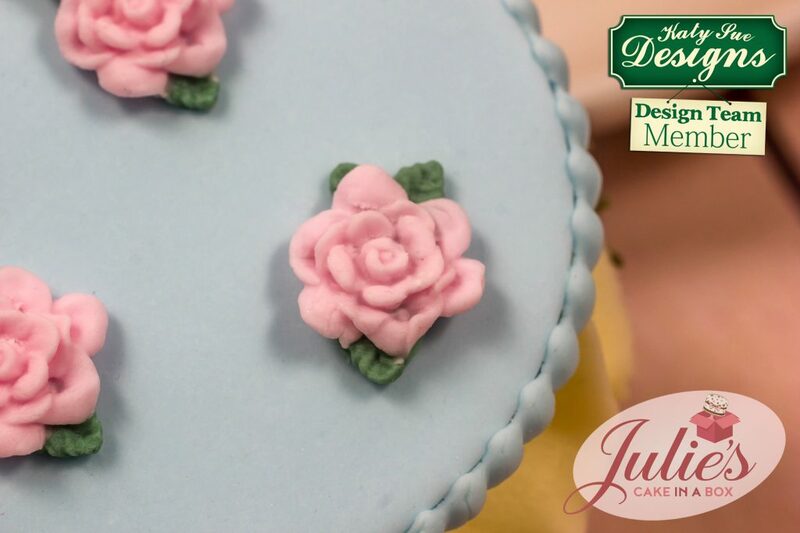 Add a small amount of pink sugar paste to the center of the mold to make the rose, then a small amount of green at either side for the leaves. Remove from mold and stick to the teapot with edible glue. Repeat until the teapot is decorated. When the handle and spout are firm enough to hold their shape, insert cocktail sticks into teapot in the desired position. Spray the teapot with clear glaze spray (it is best to apply 3 or 4 light coats, allowing them to dry in between until desired amount of shine is achieved). For the cupcake toppers, use white sugar paste together with the left over pale pink and pale blue sugar paste, adding tylose powder to each. Roll each color to the thickness of a £1 coin, then cut out 2 circles from each color (slightly smaller than the top of the cupcake). Use the smallest size Katy Sue Rope Border Mold to make 2 ropes of each color. Stick to edge of each circle with edible glue, trimming off the excess length. Use Katy Sue Rose Medley Mold to make roses and rose swags. Stick 3 medium roses or 1 rose swag to each cupcake topper with edible glue. Bake cupcakes and allow to cool. Pipe a buttercream swirl on top of each cupcake and add sugar paste topper. Arrange cupcakes on cake drum, in front of the teapot.